I’ve always read novels and watched films that are speculative in nature more for the metaphors and meaning and less for the violence and the macabre. My recurring question is often: what do the words and images say about all us as people? So my fascination with zombies, the undead makes sense. It’s personal because of members of my family are suffering from dementia in their old age. Speculative fiction including the zombie genre, also gets me thinking about the deeper meaning of life including our spiritual lives. The fascination with zombies goes back further for me as a teen, when I first read Mary Shelley’s novel Frankenstein in which various body parts were reincarnated as a zombie whole. I can list many Frankenstein incarnation on film going back to black and white movies. Fast forward to “28 Weeks Later,” the film, which jump-started the zombie craze in the 21st Century. And we can’t forget AMC’s “The Walking Dead,” still currently on television because of stellar ratings. These zombies can be interpreted in many ways but here are just two that I’ve drawn from reading Issac Marion’s zombie bestseller Warm Bodies: zombies as a metaphor for Alzheimer’s and the moral tensions between being undead and human. There isn’t a more complex map or landscape than the human brain. And when Alzheimer’s takes hold, that map slowly painfully shrinks, reconfigures, and disconnects. The person inside once known as dear grandma or loving father becomes someone else. Like the violent zombies that beloved someone, our beloved someone, can become alien wielding a knife or screaming, really shrieking. These people, our people, mirror those in Warm Bodies. As is true of the zombie genre, the undead mindlessly seek flesh to continue shuffling along. Our own people suffering from dementia simply shuffle along. Yet for grandma and dad, there is something going on inside, a struggle against the dying of the light. Something of their moral selves sputters and flickers. The interesting turn with Warm Bodies is the many zombies display varying degrees of sentience as is true of the many stages of Alzheimer’s that ultimately lead to death. R, the central character, has a soul. He’s driven by eating flesh but also grapples with the meaning of God in his life, and the tension between eating and killing in relationship to the sanctity of life. And it seems love, central to most organized religions including Christianity, truly transforms R, the undead. Will R stop eating flesh because it is the right thing to do? Will love transform him from a killer to the redeemed? Will he make the moral, the right choice? As the world grapples with increasing numbers of people living longer and dying from dementia or it’s related medical complications, some family and friends forced to stand by and watch a slow death, cling to love. Alzheimer’s patients,our people, ultimately succumb to the disease seemingly undead, particularly in the last stages. For some, our fascination with zombies is fueled by reality filled with dementia patients including those with Alzheimer’s. I don’t want to give away too much concerning Warm Bodies’ plot, including the love story. I will tell you I was moved by R, a zombie listing and tilting between right and wrong, moral and immoral. The polarities are fascinating but the inherent moral struggles are enthralling. If you pick up the book, consider the parallels to Alzheimer’s and morality as you read. 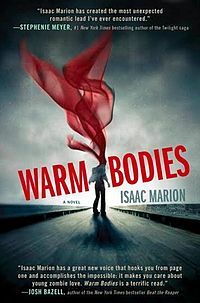 The alternative to reading is watching the film Warm Bodies, a zombie romance, which will be out in a theatres near you on February 1, 2013 just in time for Valentine’s Day. I hope the nuances in the novel are ultimately matched in the film.